It's all too easy to write off the Irish construction industry following the taming of the Celtic Tiger, but that is overly simplistic. The real story is that, despite a truly shocking downturn and the near total collapse of the native building trade, there are a number of material producers who are soldiering on, managing to keep production going, providing incredibly valuable employment for a beleaguered industry, and surviving in an economy that is slowly but surely limping back to health. And much of that survival is driven by export. If there's no demand for construction materials in the home market, let's cast our eyes across the water, to Ireland's biggest trading partner, Britain, to the less troubled markets in Europe, and even further afield to the cash rich economies of the Middle East. And so the Irish export agency, Enterprise Ireland, kicks into gear and arranges a two day visit for British-based 'persons of influence' to showcase the hard-landscaping products and services that are available from Irish businesses. Day 1 featured a visit to the Co. Wexford manufacturing facility of Kent Stainless who design and manufacture a wide range of street furniture, some of which is truly stunning in its clean, simple but exceptionally stylish design. Somehow, my alleged 'influence' didn't extend far enough to get me on the bus ride south, so I missed the factory tour, but I'll put that right on one of my subsequent visits home later in the year. However, Kent's marketing director, Shane Curtin, was given a second bite of the cherry by having a static display at the Kilsaran Factory, and presenting a 45 minute showcase package at the end of Day 2. So, for most of us, Day 2 was the big show, starting just after 8am with a trip out to the far end of Dublin Port and the main EcoCem manufacturing facility. Given that EcoCem freely admit on the journey through the badlands of the port that cement is responsible for more pollution in the form of CO2 than any other material on the planet, to refer to your product as Eco-anything seems either exceedingly naïve or marketing bluster on a galactic scale. 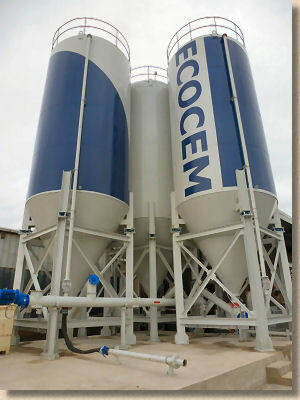 EcoCem get away with it because their product is essential GGBS, Ground Granulated Blastfurnace Slag, a waste product of steel production, which is shipped in from the busy steel producing areas of Spain, run through a ball mill and then shipped out as a partial replacement for OPC. There's no expensive cooking in a kiln involved, just basic milling, so the CO2 is minimal. There are also several benefits to using GGBS: it gives a concrete with a lighter, brighter colour, so it's cleaner looking and better at taking a dye, which is mighty useful if you're producing, say, coloured concrete block pavers or coloured mortar screeds and renders. It's also tougher, continuing to harden well beyond the normal 28-day measuring point. And it's more resistant to those nasty de-icing salts, which is part of the reason why Ireland's National Roads Authority (NRA – similar to Britain's Highways Agency) now requires all major concrete bridges to use GGBS. It's also exported to Europe and is heavily involved in a mining scheme in Finland. 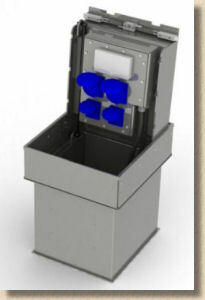 GGBS can't act a total replacement for OPC; it needs a minimum of around 10% OPC to initiate the hardening process, and most applications will see 40-60% of the usual OPC content replaced, but when you consider just how polluting is OPC production, every single percentage point that can be switched to GGBS represents a significant benefit to the planet. The new bagging machinery in full flow Back onto the coach and a run across the Liffey to the north side East Wall where EcoCem have a temporary home for their state-of-the-art bagging plant. They are trying to get planning permission for a plot right next to their main production plan on the south side, but for now, they have a yard amongst the oil and gas silos where they are busy bagging their EcoCem into 25kg bags for the Irish and the British markets. Exact distribution details are still a bit commercially sensitive, but expect to see the distinctive bags in a Builders' Merchant near you later this summer. We are just at the start of a revolution in cements. Over the next few years, the industry will come to rely more and more on GGBS and other alternatives to OPC. Many of the manufactured products we're already using incorporate some GGBS, but the next stage is to get us using it in our everyday mortar and concrete mixes out on site. You are witnessing the future. Right! Load everyone onto the charabanc once again and set off north-westwards for the lush pastures of the County Meath and the relatively new factory belonging to one of Ireland's leading CBP and flag manufacturers. 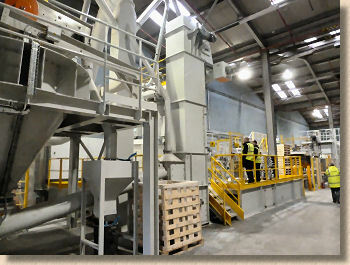 Kilsaran Concrete Products opened their impressive all-under-one-roof new plant back in 2008, and more or less just as the last roof panel was hoisted into place, the Irish economy fell through the floor. However, they've had to survive, and they've had to find new markets which have come, predominantly, in mainland Britain, not least of which is the ma-hoo-sive contract to supply the distinctive w-block into the new port facility at Tilbury, right under the noses of their major British competitors. However, the morning doesn't actually start with Kilsaran, but with a fascinating insight into the thinking and working of one of Ireland's leading architectural practices, Tuomey and O'Donnell. John Tuomey and Sheila O'Donnell have been heading up the export drive of Ireland's architectural expertise with projects in Amersfoort in The Netherlands, the Technical University in Budapest, and a frankly jaw-dropping project for the LSE in that London that I, for one, will definitely be visiting on my next missionary endeavour to England's second city. I know that not all of the delegates appreciated the relevance of the architects' work to their particular businesses. After all, most were interested only in hard landscaping, but I find it mesmerising to be given such a privileged insight into how architects come up with the sometimes baffling design solutions that we are presented with, and the better we understand how architects think, the better able we are to turn their visions into reality. A quick break for lunch and then a brief presentation from Kilsaran's British Specification Manager, Robert Davenhall, explaining the thinking behind the company before splitting us into manageable groups of 7-8 people and getting on with the factory tour. Obviously, I'm not going to reveal all the commercially sensitive bits and pieces that take place in the new-ish plant. 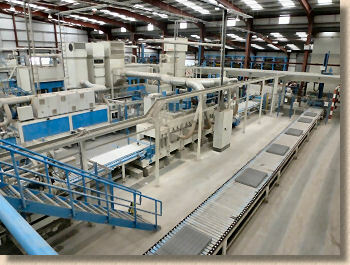 Suffice to say that it's a Hess press with a vapour curing chamber and that there are five separate secondary processing lines all in the one building which gives the company enormous capabilities and goes some way to explaining the frankly overwhelming product itinerary, which runs to several hundred different items. There's a sumptuous display facility, encompassing a wonderful indoor showroom covering at least a couple of hundred square metres, plus an outdoor display garden which is at least the size of a hurling field and probably bigger. This is how paving should be sold. I know I've said this time and time again, but when it comes to showcasing their products, the Irish paving manufacturers are a decade ahead of the Brits, and this expanded facility at Kilsaran is one of the best in the world. Why oh why can't we do something like this on the eastern side of the sea? I know the population concentration makes Dublin and environs much easier to serve, but surely the major population centres in Britain, South Lancashire, West Yorkshire, Birmingham, Scotland's central valley and even that London, must be capable of supporting such a phenomenally useful selling aid. Why does it go so wrong so often in Britain when the Irish make it seem so simple? The afternoon is completed with two relatively short presentations. 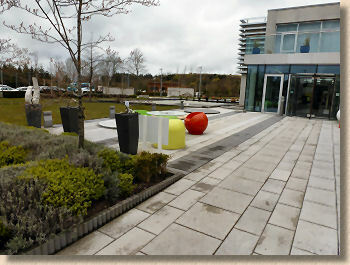 The first, from Donegal's McMonagle Stone, provides a look at the walling and paving stone supplied by the company. Although they own five quarries in Ireland's north-west corner, and are probably best known for the unmistakeable shimmering Donegal Quartzite, McMonagle Stone actually source and supply stone from all over the world. 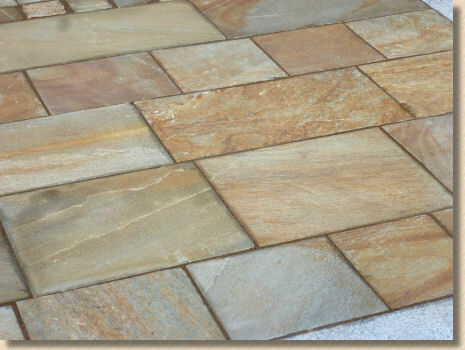 Sandstones and limestones from India, granites from China, Travertine from the eastern Mediterranean, Porphyry form Italy and South America, European granite from Portugal and so much more. 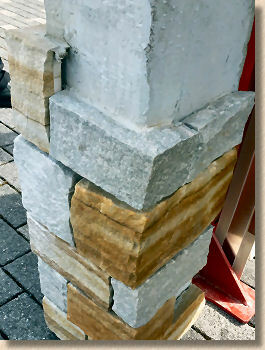 Stoneer - the Stone Veneer! The company has built an enviable reputation in the renovation market, too, supplying stone and experienced masons to all sorts of public and ecclesiastical works throughout Ireland. Their recent investment in machinery to prepare stone specifically for the cladding industry has seen the launch of the Stoneer range of simple kit-form cladding that can cope with any project from a big name 5-star hotel to a simple DIY fireplace. And as part of the export drive, they not only ship Irish stone into Britain and Europe, but use their expertise to bring non-EU stone into the market, and to distribute Jointex, a range of resin jointing mortars specifically designed for the paving trade. The day closes back where some started yesterday morning, with a presentation form Kent Stainless. It's hard not to marvel at the sleek design of Kent street furniture, but what's even more impressive is how they've developed markets outside Ireland. Much of what they design and produce is destined for overseas customers, whether that's a street market in Old London Town which uses their too-clever-by-half subterranean concealed power points, or the LED illuminated wayposts and bollards destined for Qatar. In Britain, there's a sense that all such products might well be designed in Britain but the fabrication will actually be done in China, whereas Kent Stainless manage to design *and* fabricate deep in the heart of rural county Wexford, earning invaluable export income for the Irish economy, and ensuring important engineering skills are retained by the community. I won't go into the farrago regarding the will-it-won't-it flight back to Britain which saw many of us bound for the big city of Manchester get just over 2 hours sleep overnight as neither Aer Lingus nor the weather gods seemed to be able to make up their minds as to what was going to happen, but it did rather mar what had been a very productive and informative couple of days. Yes, the 'front-line' companies looking to promote their businesses via this event all came across well, and most, if not all of us left with an enhanced opinion of EcoCem, Kilsaran, McMonagle Stone and Kent Stainless, so that has to count as a job well done, but it's worth noting the enormous support shown to these companies, and the truly outstanding effort put in by John and Laura from Enterprise Ireland for whom nothing was too much trouble, no end-of-evening drink too late, no travel drama too complicated for them not to bend over backwards to ensure everything went far better than anyone could have possibly expected. And this is important: for not only are the private enterprises of Ireland doing their bit to re-build the economy and spread the word that the nation is very much interested in business, Enterprise Ireland, as the public face of the Irish state, presents a polished, professional and pitch-perfect promotion of the country as one that is very keen to work with you, whoever you are, wherever you are, and whatever you want. Why haven't I seen such a pro-business push on behalf of the British hard-landscaping trade?